You have created your custom fields for data to be populated into, but now you need somewhere your customers can give you their information. A landing zone form is perfect for this! Not only can you attach this to any email campaign, it is also an easy tool to use for this purpose. Once you have entered the Landing Zone Editor via Creative -> Landing Zone, select 'Add New Landing Zone'. 1. 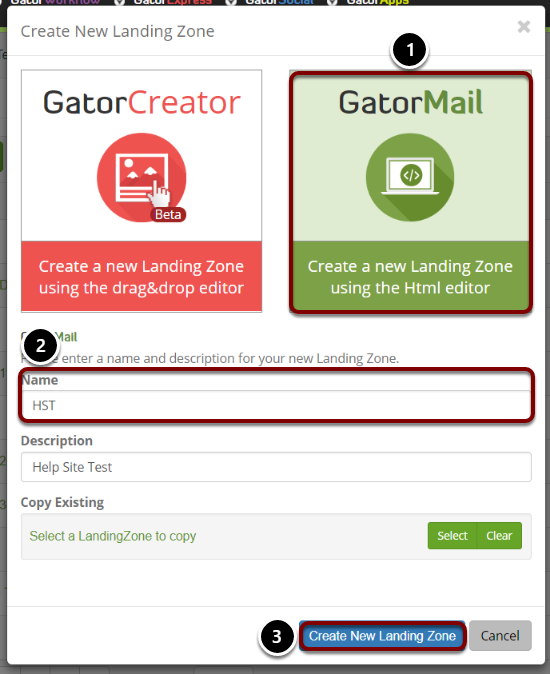 Select GatorMail as this allows you to create a fully customised landing zone. 2. Enter a Name for the landing zone, ideally 'Preference Center'. 3. Select 'Create New Landing Zone'. Here you can see the very basic form we have created. To do this we simply use a table to align the text. 1. Select the grid icon making sure that your cursor is in the correct place on the page. 2. 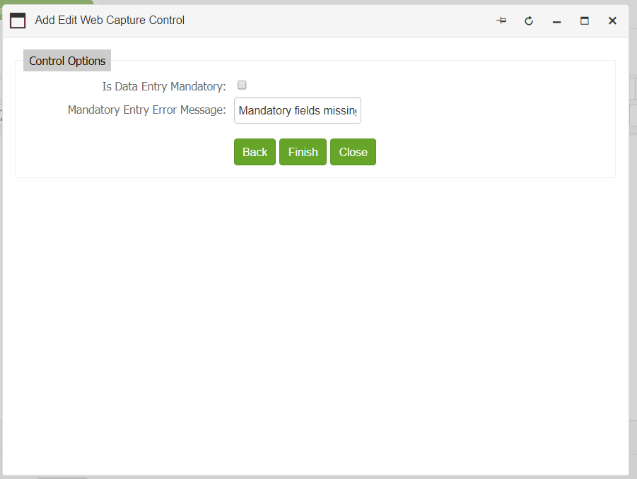 Select the web capture control button. We recommend using a 2 column grid with as many rows as is needed. This is so you have a second box to add your web capture into. 1. Give your field a name that will help you recognise what it is for. In this case we are looking at a webinar communications box. 2. Select the checkbox to populate the contacts information. This brings across any information they put in this box and match it to their contact record. 3. Select the contact field you want to connect this form field to. In this case it is our PrefGEventWebinar field which we created under contact fields. 4. For a preference center a checkbox should be the field type. 5. Make this checkbox visible. DO NOT make this a mandatory field. If you make it mandatory they have to click the box and this will opt them in to communications, thus taking any option away from them. Once created, a small grey box will appear in the form. 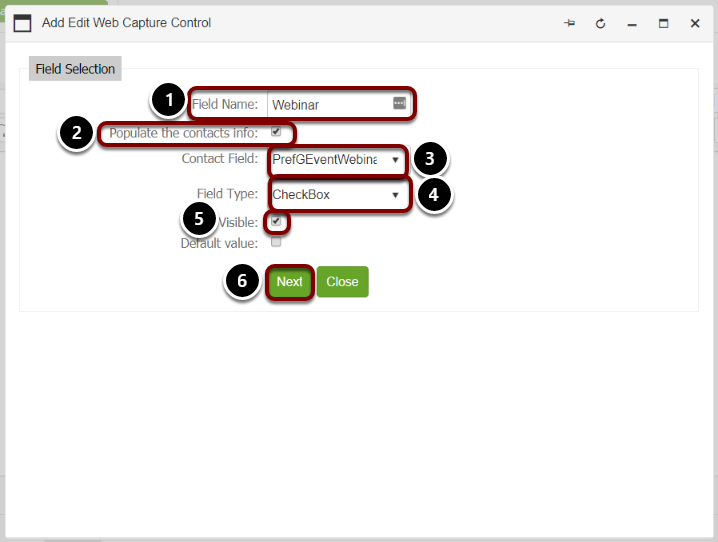 This shows you have made a checkbox web capture. To edit the field select the cursor next to the box, click Ctrl + Shift + left or right arrow, then click the capture form button. Do this for all of your fields. 1. Click on the blue hand icon to add a submit button under your webcapture form. 2. Put the text you wish to appear on your button e.g. Submit. 3. Add a description text for whilst the button is submitting the information. Success Message- Enter the submit message that you would like to appear once a contact has updated there preferences. Redirect in a new window/tab- If you would like the user to be redirected to another URL select the check box (we recommend selecting this if you are re directing them to another web page). Pass GatorLeads tracking data with redirect link- If you would like the contact to be taken to another URL and would like to track this information in GatorLeads, ensure that this check box is selected. Redirect to Landing Zone Page Number- If you would like to direct the contact to a Landing Zone that you have created in CommuniGator select the Landing Zone that you would like to take them to. This could be to a Landing Zone page that says you have successfully updated your preferences, here is what you have opted in to. 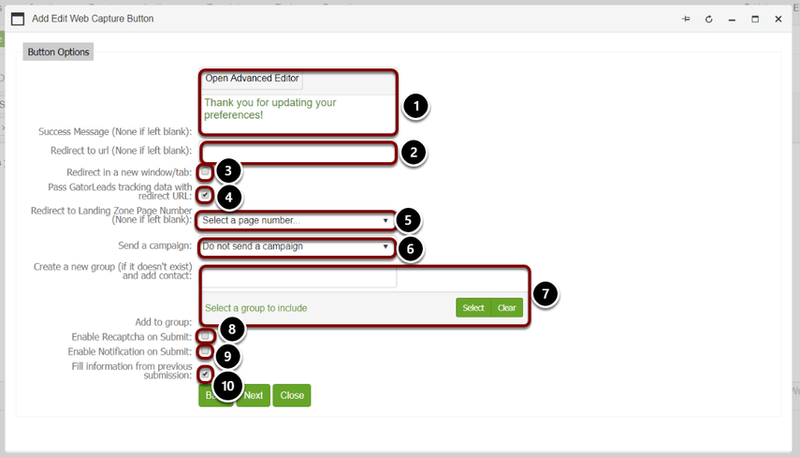 Send a campaign- If you would like to send the contact a campaign off the back of them updating there preferences select the campaign that you would like them to receive, this campaign must be set up as a refresh non-reccuring or follow up campaign and you will need to ensure that the end date is set long into the future. Create a new group (if it doesn't exist) and add contact- If you would like to add the contact into a group then enter the group name, please note this group will not appear in CommuniGator until the landing zone has been completed. Enable recaptcha on submit- If you would like the contact to complete a recaptcha form that confirms that they are a person and not a bot select this option, if you enable this button when clicking next you will have the option to set up the recaptcha text. Enable Notification on Submit- If you would like to create a notification when somebody updates there preferences select this box, please note that you will receive an email that lists all of the CommuniGator fields and not just the fields that are included on the preference centre form. If you have selected this option by clicking next it will enable you to select the email address that you would like the notifications to be sent to. Once you have created your button the text above will appear. In 'Preview' mode you will be able to see the final looking form. Adding an unsubscribe from all communications button is essential. You want your customer to find it easy to select their preferences, not for it to be a labour. To do this simply write a line that indicates this unsubscribes them from all communications, highlight the text, and select the sad face icon on the right hand side toolbar. Now you have created this form you will need to create another Landing Zone for the 'unsubscribe all' button. Once you've built your two landing zones, you will need to create an unsubscribe which will be discussed in the next article.